Rhea Patricia “Pat” Davis, passed from this life to eternity with Jesus on Sunday, January 27, 2019. Pat grew up in California, graduating from South Gate High School in 1955. Two years later, she married high school sweetheart, Ron Davis, having met him at his parent’s roller-skating rink when they were 16 years old. As a career homemaker, Pat spent her life living in Bishop, California, Green River, Wyoming, Olympia, Washington, Sherwood, Oregon. 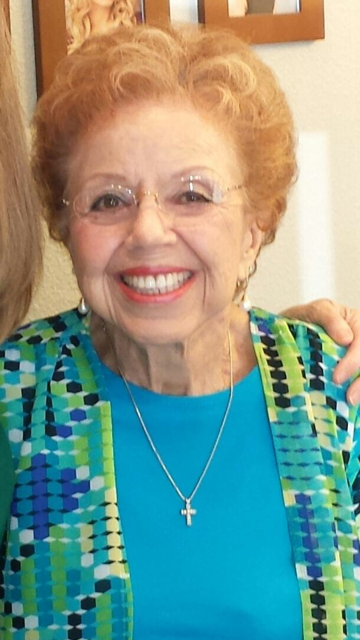 Pat was a devoted wife, mother, grandmother, daughter, aunt, sister and friend. She lived her life with passion and will long be remembered for her joyful laugh and feisty spirit. At the age of 40, Pat came to know Jesus Christ as her personal savior and never waivered from her testimony that without the redemptive work of the cross, she would be lost to sin. Married for nearly 60 years, Pat was preceded in death by her beloved husband, Ron Davis, in 2016. Recognized as an accomplished amateur artist, Pat enjoyed oil painting, as well as painting on porcelain. Throughout her long life, she was an avid collector of antiques, thimbles, pie birds, jewelry and much more. At the age of 3, Pat was crowned “Miss South Gate” and enjoyed dancing and gymnastics. As an adult, she was active in her 4-Wheel drive club, the Bells & Beux’s Bottle Club and the Christian Women’s Club. She served as a hospital volunteer and a 4-H Leader. She was also a lifetime lover of animals. Pat will forever hold a special place in the hearts of those who loved her. Pat is survived by her daughter Karen and son-in-law Jeff Kruse; daughter Rhea and son-in-law Clark Adkins; six grandchildren; two great-grandchildren; as well as her dear sister, Linda Baxter; sisters-in-law, many nieces and nephews and other extended family.